Nope. It's definitely a ground squirrel. 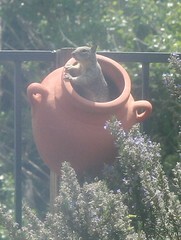 It looks sort of squirrel-squirrelly because the photo is so bad . . . if you could see the whole little dude, though, you'd see the speckled fur, and the lack of a "proper" squirrel tail.